Tianheng International Hotel is located in “Asia’s International Trade City” – Yiwu City. It is in Bei Yuan Industrial Park with only 10 kilometers distance to the airport, and is in close proximity to Hangjinqu Highway. The traffic is really very convenient. Tianheng International Hotel is a business hotel constructed by five-star hotel standard, with a construction area of 40,000 square meters. 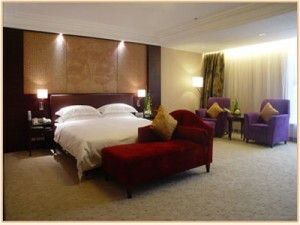 The hotel has a 16-storey atrium lobby which is nearly 16 metres high, filling the luxury and elegant style. For the distinguished feature ,the lobby is called “the first lobby of Zhejiang.” The hotel has more than 300 rooms with a variety of comfortable and elegant presidential suites, executive suites, business suites and other rooms, together with restaurants and bars of different styles (including Italian dishes, all day dining restaurant, Japanese cuisine, specialty restaurant, atrium lounge and bar) , providing a variety of excellent dining and entertainment options for its guests. 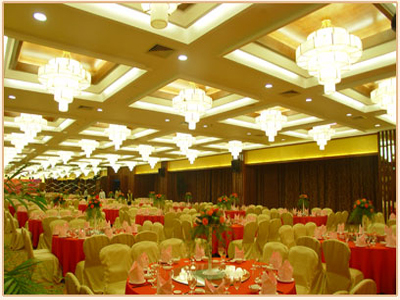 Luxury modern function rooms is your first choice to host various types of large and small government and business meetings and is also the ideal place of various kinds of Chinese and Western-style reception and balls. In addition, the hotel is equiped with fitness center, indoor swimming pool, business center, concierge, ticket center, luxury fleet and other facilities. Tianheng hotel rooms are fully equiped with stylish hotel rooms, good facilities and family-oriented sevices to provide a comfortable and relaxing place for you. You can click Yiwu Agent, Yiwu Market to view more.